Paraportator combines many sophisticated technical solutions which help to achieve the perfect combination of low weight, outstanding compactness, iwhile providing good flight performances and reasonable price. Fiberglass propeller cage foldable into a small pack. Paraportator is transported in a compact package closed by zip. Assembly begiins from the unzipping the fabric skin all around.. The bars with all suspension elements attached are safely packed inside the foldable frame. They are releaesed at this step. The frame is locked in transportation configuration with a pair of spring locks. After unfolding the frame is locked in flight configuration with another pair of spring locks. The harness bars are rotated 180 degre to the flight position. The harness welcro is fastened at back and seat. The cage beams made of aluminum or carbonfiber inserted to the holders of the main frame and locked into position with springlocks. The cage ring consisting of 7 fiberglas sections connected togther is easily unfolded around the frame and simultaneously locked to the cage beams. The protective net is permanently connected to the cage arches and needs only to be tightened. The prop installation is as usual and this is the longest part of the assmbly sequence. Disassembly is in the reverse order: 5-6 min. The foldable frame of strongest weldable aluminum alloy 7020 is designed to be strong and rigid while keeping weight and dimensions as low as possible. Most frame elements not only prform certain functions but also add to the overall rigidity. The frame folds into a well formed box shape which protects all the sensitive parts of the engine and the critical harness elements. 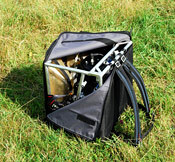 The frame srength and compact box-shape design when folded allows to transport the paramotor by practically any means of transportation without additional protection or with a minimum extra protection. The harness is made of strong Cordura fabric which not only makes a very reliable seat for a pilot but also able to protect parts of the paramotor during transportation. 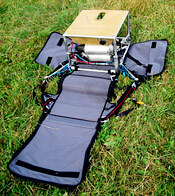 The harness has additional parts that make it possible to wrap it around the paramotor frame when it is folded and zip it to form a complete outer skin of a backpack. The harness shoulder straps are left outside and serve to carry the back pack. With the convertible harness you do not need any extra bag to pack and carry the paramotor unit because you have everything necessary with you. 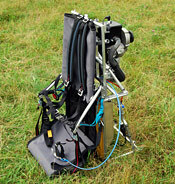 This allows to transport the paramotor from/to remote places, for example, if you had an emergency landing. As well you save the transportation weight. Suspension system of Paraportator has an original delta shaped design. The harness bars are connected to the harness straps only at their ends. This feature allows to make the bars of thin wall aluminum tubes as they are only compression loaded as opposed to bend loaded bars. Low hang points in combination with pivoting harness bars allow for active weight shifting. The delta shape design not only provides for weight saiving becaus of favorable compression load of harness bars but also adds to pitch stability of entire paramotor unit under varying lods and thrust conditions. The propeller cage consists of 6 conical beams made of high strength aluminum or of rigid carbon-fiber and of 7 fiberglas arc sections coated for protection by polyehylene. The ring sectors are interconnected by flexible elements which attach to the beams rigidly when assembled for flight. The construction of the cage makes it very compact when disassembled for transportation. The cage can be assembled andand disassembled quickly and without mistakes. The resulting cage has low weight and sufficient rigidity and provides good propeller protection for pilots with intermediate or higher experience. The suspension bars are attached to the frame through 2-way pivoting joint. The bars can rotate around vertical axis. This movement is restricted by screws which prevents bars from moving towards pilot's body in flight position while allowing them to rotate backwards, when folding. The bars can at the same time rotate around a horisontal axis. Their movement is restricted in upward direction by adjustable straps. Vertical pivot allows the bars to be rotated into folded position without the necessity to detach them from the frame for transportation. 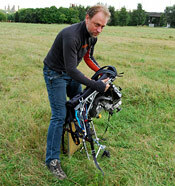 Horisontal pivot allows for efficient weight shift steering and at the same time the resricting strap allows to adjist the paramotor pitch in flight. 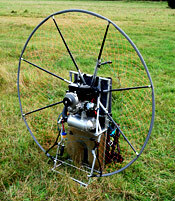 Resonant exhaust systems of the 2-cycle engines used (Top80 and Fly100Evo) were severely modified to make them more compact to fit into smallest possible dimensions of the paramotor frame. All the modifications were made in such a way that the resonant properties were pereserved and the engines' performances were not scrificed. Modified exhaust made realization of Paraportator concept possible at all. Without making compact resonant pipes the engine unit can not be efficiently packed into a small volume without detaching the pipe. Patented cage-lock mechanism consists of specially shaped pivoting elements interconnecting the protection ring sectors into one foldable chain and of complimentary pins attached to the cage beams. When the lock is fastened the ring is firmly attached to the beams. The locking mechanism does not allow the ring to tilt in any direction. When unlocked the ring easily folds into a compact bunch. The cage assembly takes only about a minute. Simultaneously one does not have to worry about which part where to connect as the ring stays connected when disassembled while at the same time the assmbly is sufficiently rigid. The fuel tank is made of aviation-grade fiberglass-epoxy composite and fully integrated into the frame. Its shape is complimentary to the shape of the frame members and has a hollow to accomodate the engine reduction gear when the frame is folded. At the same time the tank can be easily detached by unscrewing of only 4 screws. 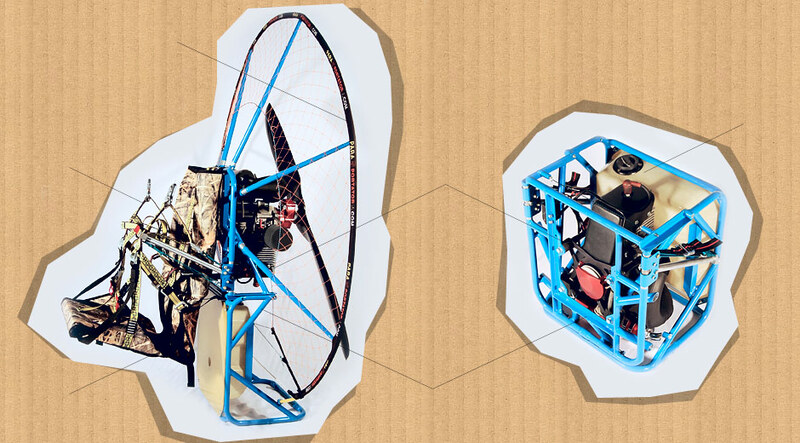 Integration of a strong composit tank into the frame structure provides additional rigidity to the paramotor structure both in folded and unfolded state. Special shape of the tank helps to keep smallest possible sise of the paramotor when folded by using the volume in the most efficient way. We designed a special throttle control handle which is simple but very convenient in flight and during ground handling. The lever is operated by teh forefinger. 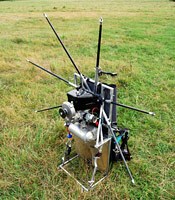 The throttle implements the principle similar to that of Cameleon trottle produced by AEF-gliders. Easy for any kind of start. Minimum effort in long duration operation. Perfect for small gas adjusments in level flight. One-hand operated simple and reliable spring locks for securing the frame in folded and flight configurations. With this simple locks you are able to fold and unfold the frame in seconds while being sure that the locks would not fail neither in flight nor in transportation. Flight autonomy up to 3 hrs. up to 3 hrs. *Including propeller, cage and propeller pack. Paraglider and paraglider pack is not included.